No matter what the calendar says, it's hard to fight the pull of the Fall. It's hard to ignore that the days are getting shorter, the nights cooler. It's hard to see the sweaters in the store windows, and as much as I don't want them, I want them. I just wish summer ended on September 22nd, and not September 1st. Have you entered to win a piece of your choice from Hello Cheeseburger yet? P.S. The blog shop has been updated! eyelet, stripes and gold... YES PLEASE!! I love the light you captured in these pictures. It's so crazy how quickly summer went by! 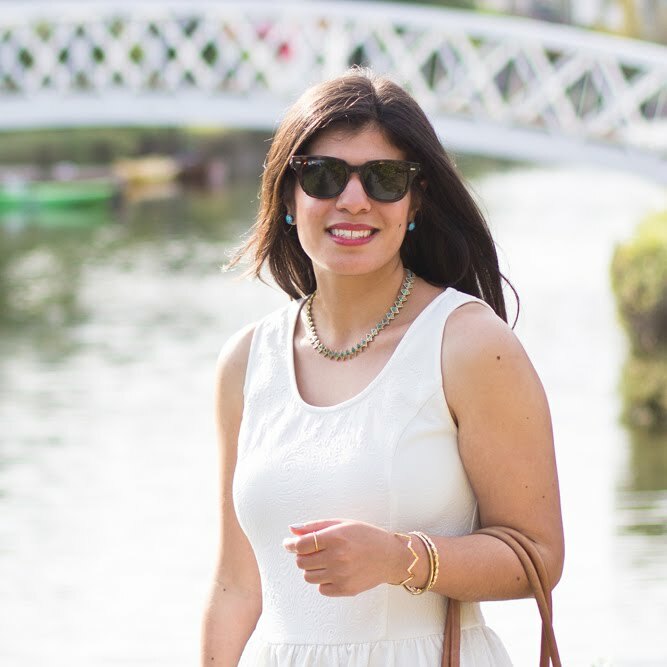 Love this summer look! While I'll miss summer, I'm looking forward to Fall - Fall fashion is the best! Have a great weekend. well, what can i say, sometimes I wish I had fall season here to add those lux sweaters and cover ups. 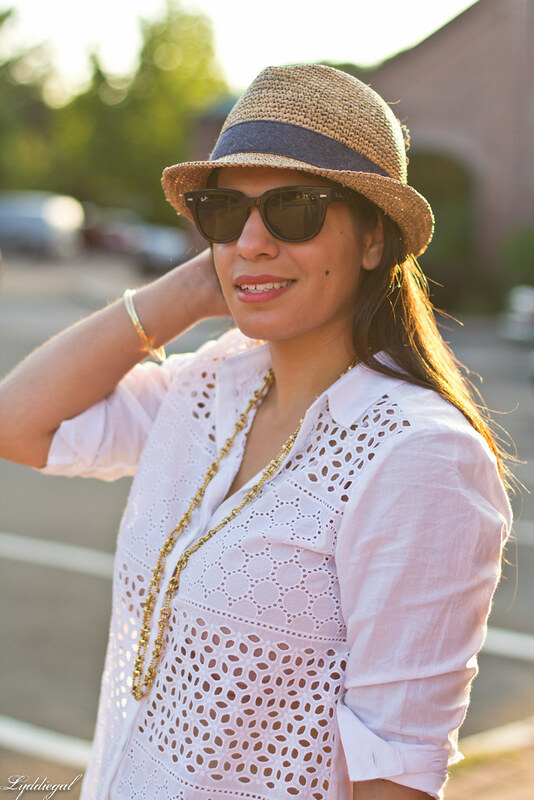 Oh I love how the eyelet top looks with stripes! Great combo! 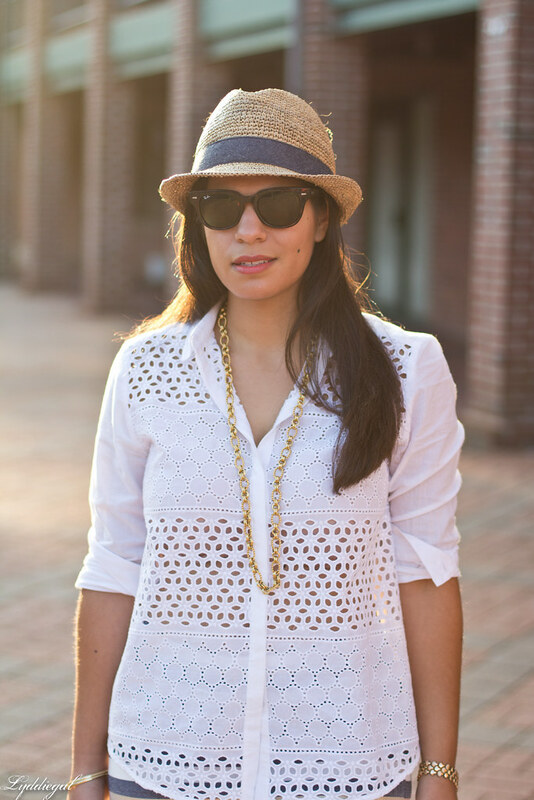 There is nothing better than a white eyelet top and you wear it all very well. I am happy to say that Summer usually ends around year end for me and I am thankful. Enjoy! I wouldn't mind fall if I lived somewhere warmer. And if fall wasn't proceeded by a never ending cold, slushy winter. I love the blouse and striped skirt today SO MUCH Lydia! Enjoy your long weekend! So great look, love love. As much as I want it to be fall, the temps here in NC are just too high to be wearing fall clothing! I love this top with the cut outs! I love that skirt, its a great transition piece into fall too! Lydia that top is gorgeous girl. I've started shopping for Fall unfortunately. I'm just going with the flow. I saw Halloween stuff out today! I wish summer was a bit longer too! I hope you at least get a little more summer weather in CT for the next month! Have a good weekend dear! I have that skirt, so it is always fun to see someone else style it. Summer seems to have gone so quickly! I am excited about fall though! I love your color palette here--khaki and that denim blue go well together on you! I look forward to fall because it almost feels like a new year, but I don't want fall to come because I don't want the days to be shorter and colder. Wonderful shirt & nail polish! 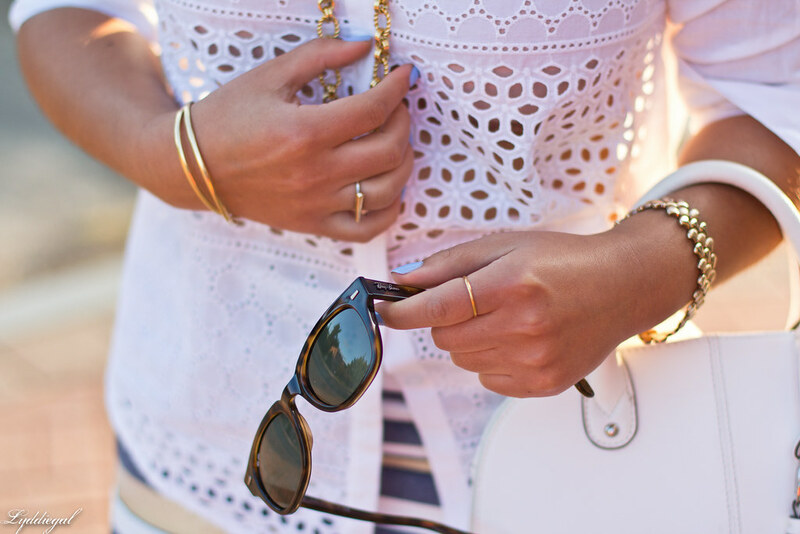 That eyelet shirt is such a gorgeous piece! I really hope that the weather stays warm through the end of September. I'm never ready for fall to come! What a cute outfit! You look gorgeous as always, Lydia! 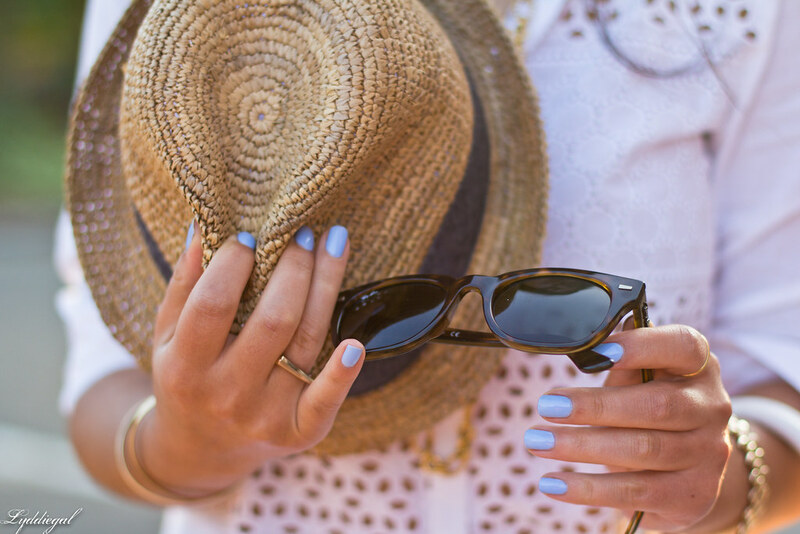 This is such a cute Summer look. I love the hat and the cutouts in the top. The stripes are perfect too! If Labor Day were moved closer to September 22, then fall would end then. It's funny how things actually change on dates far separate from the unofficial starts and finishes. If you ask me, it's still summer. It's too hot to switch to fall clothes anyway. Besides, who would want the onset of fall when you have that gorgeous shirt to wear?